A house that sat empty for fifty years as its dead owner instructed. A locked room with no key. A single father with eight-year-old twin girls. A dusty, dank nursery from long ago that no child ever played in. There are eerie things going on at The Arbors in St. Francisville, Louisiana. Architect Bart Blanchard is joined by his friend Callie Pilantro (“Callie – The Bayou Hauntings 1”) and Landry Drake (“Forgotten Men – The Bayou Hauntings 2”) to learn the secrets of a domineering matriarch whose two husbands died in bizarre manners. As they discover more secrets in the house, someone watches from a hidden room at the very top of the huge old mansion. 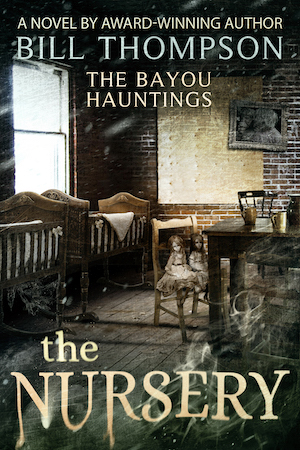 “The Nursery” will keep you up late at night wondering what’s behind the next door, what lies beyond a mysterious mirror and who waits to kill one of the people at The Arbors.